LG refrigerators with refrigerator temperature issues. 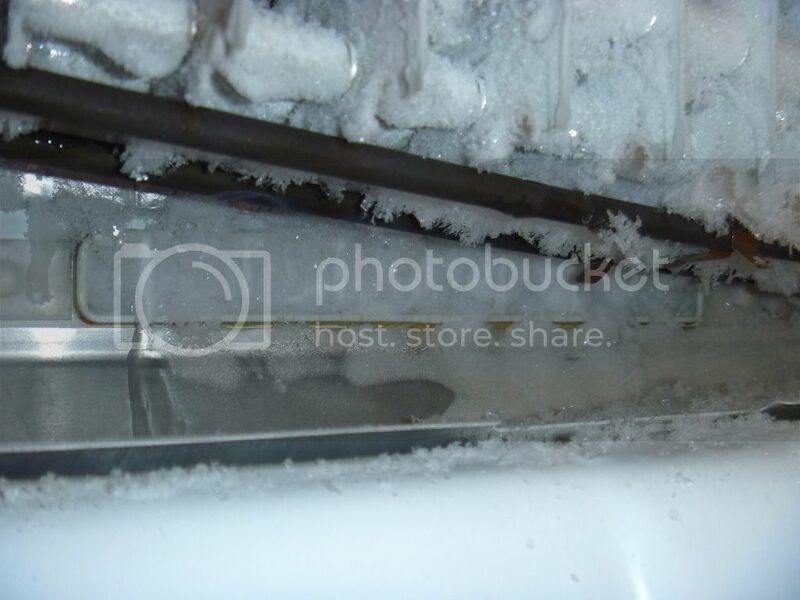 When you guys come across an LG french door refrigerator or something similar such as Kenmore or GE and have an excessive ice issue, remember to raise the evaporator up to expose the return air vent from the refrigerator. A lot of times, you will get a call for the refrigerator not cooling but the freezer is doing alright. To quickly test this, open one of the refrigerator doors, hold down the light switch button at the top of the hinge and check for cool air coming out of the vent. Allow 15 seconds for the damper door to open. If none, open the freezer door and repeat the test with the refrigerator. If you do get cold air coming through the vent when the freezer door is open but none when the freezer door is closed, you have a plugged return air vent inside the freezer. You will need to use a steam machine to clean this out. In this situation, there was no defrost problem. This was an air circulation issue. The refrigerator temp thermistor would keep telling the computer that the refrigerator temperature was too warm and would keep the compressor running all the time without going into defrost. So it would just keep circulating air in the freezer for 1 week till I got to it. Once the ice was cleared up, everything worked fine. I attached some pics for all to see what I'm talking about. Hope this helps make your job a lot easier. Re: LG refrigerators with refrigerator temperature issues. So did you replace the fresh food thermister then? 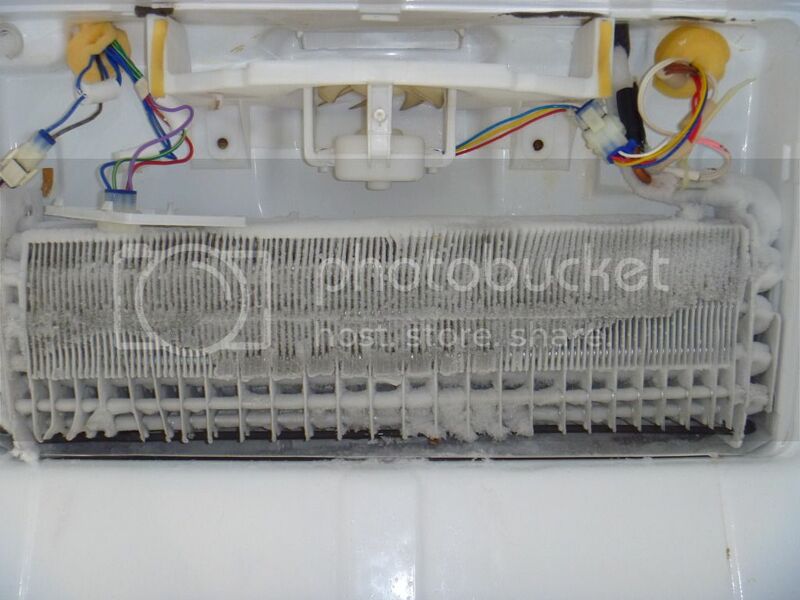 I see your point with the lack of return air for the ff section but the coil still shouldnt have the frost pattern shown here with out a defrost issue. Namely the defrost thermistor being a problem. It looks like the thermistor is telling the m.pcb to go into defost too late and killing the defrost cycle too soon. I see that the defrost controller is enveloped in frost / ice. It should be telling the m.pcb to go into defrost with as much ice as it has around it. The defrost cycle is adaptive and overides any call for cooling. No matter what the ff thermistor is telling the m.pcb it will overide that and defrost before trying to cool anything. Otherwise attempting to cool with a frosted up coil would be pointless. Green apples to red apples but I've seen blocked return airs in different units before and the ice buildup is usually localized to the return air opening area when it is not that close to the heater. In this case it appears that the ice / frost is being melted away from the bottom of the coil fairly well but not enough to melt what was built up in the return opening. Just my experience. Take it for what it's worth. No I didn't. I want to wait and see if they were going to have any problems temperature wise. So far, everything is working fine. I suspect that some liquids got spilled down the backside of the crisper drawers and emptied down the return vents where the liquids froze in the return air vents. I find a few with solid ice formed at the top, evap frosted fine. Complaint was noise,fan hitting ice ?? Thanks for the information and the pictures. Helps being able to see the issues.